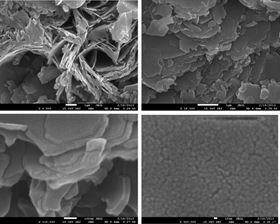 SEM micrographs with different magnifications of ZnO nanoplatelets synthesized by the microwave-assisted combustion method. A simple microwave-assisted combustion route was used first time for the preparation of nanocrystalline ZnO nanoplatelets using dissolution of zinc nitrate as the oxidant and glycin as fuel. The structure, morphology and composition of the as-prepared samples were investigated by X-ray powder diffraction (XRD), Scanning electron microscopy (SEM) and Energy dispersive X-ray spectra (EDX). The XRD results confirmed the formation of single phase hexagonal wurtzite structure of ZnO and SEM pictures indicated that the sample includes the nanostructured nanoplatelets with the porous surface of the products. The optical properties were determined by a UV–vis spectrophotometer and the results showed that the as prepared ZnO nanoplatelets have larger band gap of 3.06 eV. Vibrating sample magnetometer (VSM) was used for the magnetic property investigations and ZnO nanoplatelets indicated room temperature ferromagnetism which is intrinsic in nature and attributed to oxygen and/or Zn deficiencies as found in EDX results. This paper was originally published in Ceramics International, 40 (2014), Pages 4673-4679.